Elizabeth Taylor is known as the last major star to have emerged from the old Hollywood era. One of the most iconic things about the amazing Elizabeth Taylor, was the incredible jewels that she acquired mostly from the men she was associated with throughout her lifetime. It is said that when Elizabeth Taylor was born, she didn’t open her eyes for eight days and when she did the first thing she saw was her mother’s engagement ring and from then was hooked. The Taylor Burton diamond is one of her most exquisite pieces, it was known as the world’s first million diamond to be sold at public auction and was first bought by Cartier owner Robert Kenmore. Elizabeth Taylor’s lawyer was in fact bidding on the auction but lost out to Kenmore and was immediately in touch with him after the auction to try and obtain this incredible item. It was thought that Burton and Taylor paid 1.1 million dollars for this 69.42 carat diamond. Originally bought with the intention of being worn as a ring, Elizabeth Taylor realised soon enough that it was too large for a ring and was placed into a necklace, and wore it publicly for the first time at The Prince of Monaco’s 40th birthday. In 1979 Elizabeth sold this piece for 3 million dollars to help finance her then husbands John Warner senate candidacy. The Taj Mahal was given to Elizabeth by her husband Richard Burton for her fortieth birthday. Burton was said to have bought the piece for his wife as he couldn’t buy her the Taj Mahal building. Once bought Elizabeth went on to replace the original silk cord that the piece hung on, replaced with a diamond and ruby necklace. 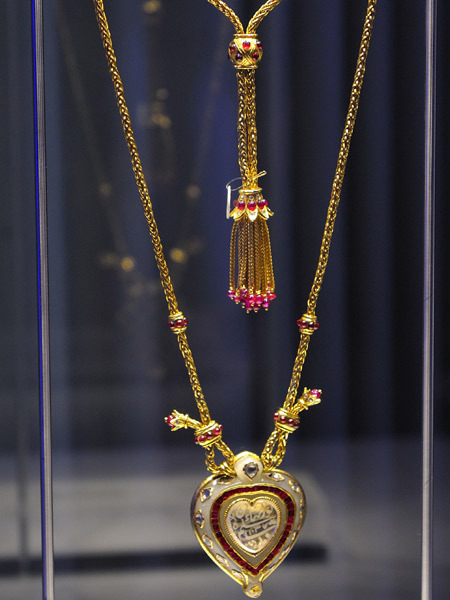 The Cartier designed diamond and ruby necklace was bought for a price of £350,000. It later went on to sell for $8.8 million dollars. 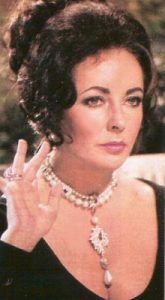 Besides incredible diamonds, Elizabeth Taylor also had an impressive collection of other fabulous gemstones. For her engagement present from Burton, Elizabeth was given a diamond and emerald brooch which she teamed with the emerald necklace he gave her as a wedding present. 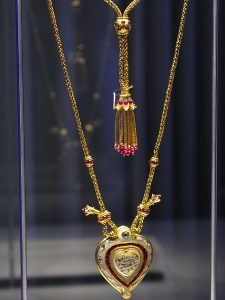 As a gift for her thirty seventh birthday in 1969, Richard Burton spent an incredible $37,000 to outbid the Prince Alfonso to purchase the one of the largest and most historic pearls in existence La Peregrina Pearl, weighing an incredible 203.8 grams which dates back as far as 1554 when Mary Tudor of England owned it. One of her most worn pieces of jewellery was The Krupp Diamonds. This 33.19 carat Asscher cut diamond was a gift from Richard Burton in 1968 at a price of $385,000. The Krupp diamond is regarded as one of the most flawless diamonds in the world. According to Elizabeth, “the Krupp was my prize for beating Richard at ping-pong!” It got its name from a previous owner Vera Krupp who supplied the Nazi’s with arms during the war and she had acquired it from Harry Winston jewellers. It is reported that Elizabeth was noted to say “When it came up for auction in the late 1960s, I thought how perfect it would be if a nice Jewish girl like me were to own it.” This prize possession resulted in a bidding war that Burton won beating Harry Winston. It was noted that this ring rarely left her finger. This entry was posted in Interesting Facts About Diamonds and tagged Elizabeth Taylor, Jewellery of ElizabethTaylor, La Peregrina Pearl.